A tachometer is gauge to measure mechanical speed in units of RPM (Revolutions Per Minute or Rotations Per Minute). On vehicle, tachometer is measuring engine speed. More about the function of tachometer can be read in the article "What Is Tachometer Function On Vehicle?" . Aftermarket tachometer wiring is oftenly confusing as it has no information from the manufacturer. No manual, no wire labels, and seller also doesn’t know how to connect wiring. While mechanic rely on trial and error method. As mechanic doesn’t record and doesn’t understand the test procedure, mechanic often tries same wrong combinations over and over, and making high risk of damaging the tachometer. Yellow wire is connected to ignition switch ON position, to connect to positive ( + ). Green wire to negative ( - ) or body or ground wire. Black wire for signal, connected to negative of coil, to allow tacho to 'sense' engine speed. This analog tachometer is suitable for motorcycles with one cylinder four-stroke (four-cycle) engine, such as Honda bike and mostly motorcycle engine today. If it is used on a motorcycle with one cylinder two-stroke engine, this tachometer will read twice the actual engine speed (RPM). The two-stroke one cylinder engine is like the one used on Vespa scooter. And if it is installed on a motorbike with 4 cylinders four-stroke engine with only 1 coil for all cylinders, then the reading will be 4x times higher. But if that engine has four coils, or one coil for each cylinder, then the reading will be accurate. Because the tachometer reading is based on only 1 cylinder. Coil positive pin is connected to the battery via ignition switch ON position, so coil positive pin can be used as current source for tachometer. If the electric current supplied by ignition switch (key switch) ON position is very limited, or the ignition wire is too small, then it can be connected to ACC (accessories) position of the ignition switch if available. Usually ACC position is just right after the LOCK or OFF position. The red wire and black wire are tied together, they are for tachometer lighting. Check with multitester if one of those light wires is connected to tachometer body, for example: if black wire is connected to body then the black wire is the ground or negative, and of course the red wire is positive and will be connected to vehicle light switch. If none of those black and red wire are connected to tachometer body, as polarity is not an issue with incandescent lamp, you may decide which one the positive wire to connect to the vehicle light switch. And other wire is connected to the vehicle body as a ground or negative . 3 factorial = 3 x 2 x 1 = 6 combination possibilities. tachometer signal or coil or tachometer sensor in order to measure engine speed (RPM). Please see the table below, the negative ( - ) or ground is always connected first and used as the starting point when using the table to check connections. Because wrong connetion to ground has a very small risk to damage the tachometer. Signal wire is always the last one to connect to coil negative pin. Because coil induction produces high voltage that can damage the tachometer. It needs only one wire connected to coil and another wire connected to your body, high voltage current will flow from coil to tachometer and to your body as ground. Thus it has high risk to damage tachometer. If your tachometer has different color code wires, then the table can be modified to suit your wiring color code. 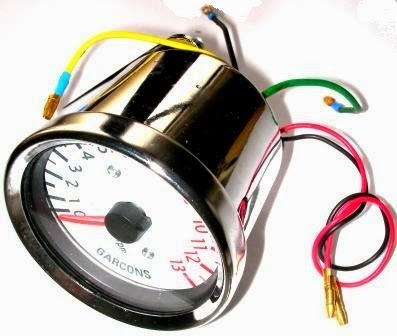 Suppose you have a tachometer with black, red and green wires, no yellow wire. So replace yellow color in the table with red color, then the table can be used. Start the engine, let it runs stationary. In order to reduce the risk to damage tachometer, always connect the negative ( - ) wire to ground first. Then connect positive ( + ) wire to ignition switch. Connect the last wire which is assumed as signal to negative pin of coil, remove this wire immediately if tachometer is not working. Especially when handling the wire which is connected to coil, use insulated tool, because coil induction voltage can shock you, though not fatal. See the first row on the table, connect the black wire to the body or to negative ( - ). Then connect yellow wire to positive ( + ) from battery or ignition switch. And the last wire which is green wire to be connected to coil negative pin. See if the tachometer needle moves. If tachometer does not work then immediately disconnect the green and yellow wire. don't leave it for too long because it can damage the tachometer . Mark column 'Check' at row 1 on the table with X sign, which states this wiring is wrong, so we will not reconnect it anymore. Continue to second row, connect the black wire to the body or negative ( - ). Connect green wire to positive ( + ) from battery or ignition switch. And connect yellow to coil negative pin. Check if the tachometer needle moves, if tachometer does not working then immediately disconnect the yellow and green wires. Continue to row 3, and so on until we found the correct wiring connections. If we have already found correct connections, for example, row number 4 is the correct one. Then no need to proceed to number 5 and 6. Because there is only one correct way of wiring, we can conclude that other ways are wrong . Permutations mathematic as above can also be used to find the combination of component wiring other than the tachometer. 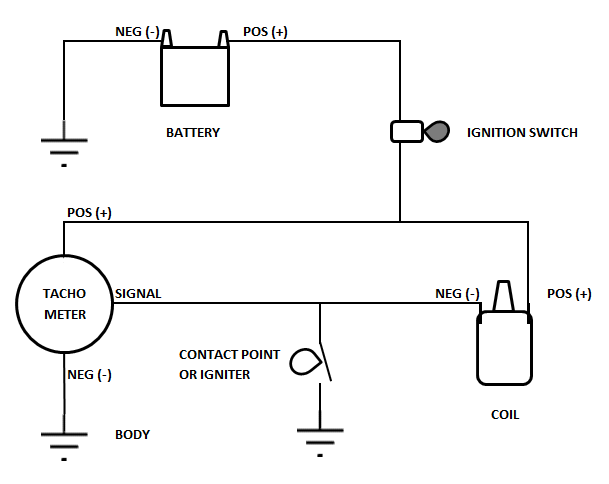 For more details, the following schematic illustrates three main wires of tachometer wiring. As on the schematic, the positive wire from the tachometer is connected to the ignition switch. Signal wire connects to a line between coil negative and contact point. Contact point is replaced by igniter for vehicle with electronic ignition systems. Tachometer negative wire is connected to the vehicle body. CAUTION: Do not connect a wire to coil output. There is a large diameter wire with thick insulation connected to coil output, this big wire is spark plug wire, it connects coil to spark plug. High-voltage (>10,000 volts) of coil output will damage electronic devices. To keep the above schematic simple yet easy to read and to understand, tachometer light wiring is not included. Light wiring is simple and easy to understand, even without schematic. Read also how to match wristwatch with your style. Coil has same function as a transformer or trafo, in the ignition system coil is used to rise the voltage. Trafo and coil only can increase or decrease voltage if its magetic field is changing. To change magnetic field, trafo is supplied with alternating current (AC), or with pulsating direct current (DC). Coil works with Ruhmkorff inductor principle, with pulsating direct current to increase voltage. Contact point serves to cut off electric current from coil primary winding to the ground, magnetic field will collapse and induce high voltage to the secondary winding or coil output. The high voltage output of coil can jump over spark plug gap, causing electrical spark. Spark will ignite gas to burn, and create pressure to push the piston to produce mechanical power. In electronic systems, contact point is replaced by igniter. Because contact point / igniter has function like On-Off switch, the pulsed voltage is recognized as a signal by tachometer to measure engine speed. Amazon best seller automotive analog tachometers and digital tachometers: Sunpro, Auto Meter, VDO, Equus, etc.. I've tried this permutation procedure and found it works to my aftermarket tacho meter, although my wiring has different color coded. But then my bike is loosing power. No problem if sensing wire disconnected from ignition coil. It seems that tacho sensor is drawing too much electric current from the coil. Any suggestion to solve that problem?? I think you need to build a transistor circuit to connect sensing wire to coil. Transistor base draws only a few milliamperes current for activation. You will need to find out base resistor value to adjust transistor current to match with tacho sensing current. Tacho sensing wire is connected to transistor emitter, and transistor collector is connected to positive battery (+) or ignition key. The transistor is working like a relay switch to supply current for tacho to sense engine speed, and that relay switch is controlled by coil or igniter.